His passion: Really good wines. There are people who are clearly blessed from the very start, brimming with a full range of impressive talents. Philipp Schwander, proprietor of the Selection Schwander wine store with branches in Zurich and St. Gallen as well as being the first and, for 20 years, the only Swiss awarded the title of Master of Wine, is one of these people. He was born with a sensitive nose and an impeccable memory for tastes and flavors and blessed with a storyteller’s skills, and a gift for sharing his knowledge of wine in a most charming way. 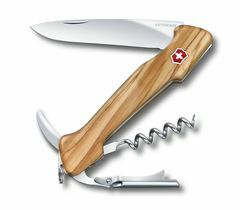 He was the one who came up with the idea of a handy degustation tool for when you’re on the road and, in close collaboration with the Victorinox product development team, his idea was honed and perfected. The result? A true collector’s item with the functionalities of a corkscrew, a waiter’s knife and a knife for picnic snacks all rolled into one: The Wine Master is specially designed for cutting the foil and opening bottles in style, as well as slicing bread, cheese, salami & co. for a tasty outdoor snack. Superb handling, elegant design. Philipp Schwander inherited his love of wine, especially Bordeaux wine, from his father and also an old travel guide which led him to this region as a youngster, after buying an Interrail ticket on the spur of the moment. That was where it all started, and from then on, all his pocket money went into his hobby, with binder after binder stuffed full of labels and descriptions of the character of each wine. His intelligent articles in the Zurich newspaper caught the eye of Martell, the St. Gallen wine dealers, who hired him immediately. After many years as their head buyer, followed by a spell as director at Albert Reichmuth, the Zurich wine merchants, he took the plunge in 2003 and set up his own business. With 60,000 customers, Selection Schwander is now one of the biggest wine importers in Switzerland. Awarded the title of Master of Wine, Philipp Schwander is one of only 280 experts worldwide currently holding this title. The most daunting test in the world lasts a whole week and candidates must undergo daily blind tastings where they must demonstrate their wine-tasting expertise. In addition, candidates face extremely complex written exams which require extensive knowledge and the ability to formulate and communicate independent thinking and theories. Only those who are true authorities on the subject have any chance of success. As a result, the failure rate is high and is almost always well above ninety percent. The idea of a handy degustation tool specially made for outdoor enjoyment was born and gradually took shape in the mind of our ambassador of wine. “I’ve already held so many corkscrews in my hand and thought, yes, this product is actually OK, but there are a few things that could really be done better,” Schwander tells us. “And mostly I’ve missed having a really good knife for preparing a tasty snack, so this is new and something we haven’t seen before.” With the Wine Master, details like weight, size and functionality have been conceived and executed with precision, the individual tools open smoothly and effortlessly, and if handled properly, this tool is easy and completely safe to use. 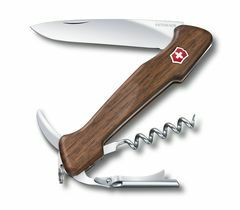 Three-in-one functionality, high quality finish and extremely comfortable to use: bring the Victorinox Wine Master along and enjoy outdoor adventures with a taste of the good life. The long, sturdy spiral grips the cork securely, the foil cutter guarantees precise, clean cuts and the stable, two-step lever protects against slippage, ensuring the cork is safely removed. Lastly, a knife with an extra-wide blade, which can cut its way through all of your favorite picnic snacks, is the finishing touch that makes the Wine Master the perfect multi-use tool. You can see the sophistication in the ideal leverage of the fulcrum and in the precision of the details, which reduce the effort required to a minimum. The scales are finished in a choice of exquisite olive or walnut wood; they combine a comfortable grip with an elegant look. This makes the Wine Master an exclusive gift that instantly appeals to wine lovers and will become their loyal companion. What does Philipp Schwander really love? Any time after 9 a.m.